"A beautiful, sombre and rigorously intelligent film" -- O.S. Scott. 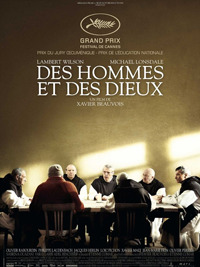 Based on the true story of eight Cistercian Trappist monks whose lives of contemplation and of humble service to their impoverished Moslem community in the Atlas Mountains of Algeria are disrupted by the country's ruthless and protracted civil war of the 1990s. The government offers military protection, which is unthinkable to these men of peace. Instead they are left with the choice of returning to France and abandoning their duty or of remaining at the risk of their lives. The beauty of the environment, the soundtrack of chanted prayers and muezzin calls, and the touching relationships that these men have formed — all contribute to make this a singularly memorable film. Winner of the Grand Prize of the Jury at Cannes and French César Award for Best Film. Marvellous, now famous "last supper" scene is very fine but a story hung on the Catholic Church in the colonized world gives me all kinds of problems.